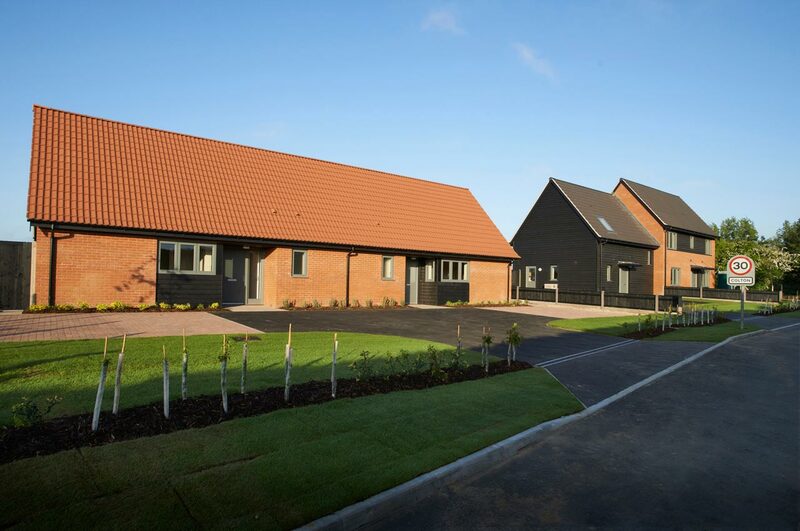 Lucas+Western Architects designed these four affordable homes for Saffron Housing Trust at Colton near Marlingford. The site is on the southern edge of the village with views out across open countryside as it falls away to the Yare valley, and is also very prominent in the approach to the village from the south. The design took this view as its starting point. The massing and broken roof line of the four houses are designed to emphasise a slight rise in the land on the approach along the Barford Road from the east, and the steep pitch ensures that the pan-tiled roofs are the dominant element in the composition when viewed across the fields from the south. Construction materials are locally appropriate – pan-tiles, red brick, black weather-boarding – but the buildings are clearly contemporary. The project was very well-received by South Norfolk’s Design Review Panel. The development comprises one three-bed house, one two-bed house and two one-bed bungalows, all designed to comply with national design-standards for affordable homes, Saffron’s own design guide and the Rowntree Foundation Lifetime Homes Standard. Detailed design for the project was led by LHS, working to Wellington Construction under a ‘design and build’ contract.